SeizureTracker.com - Download your Seizure Tracker data through the data export tool. VNS Therapy® - Settings History and Magnet Usage Tool. You can download your data from Seizure Tracker® using the export data tool. 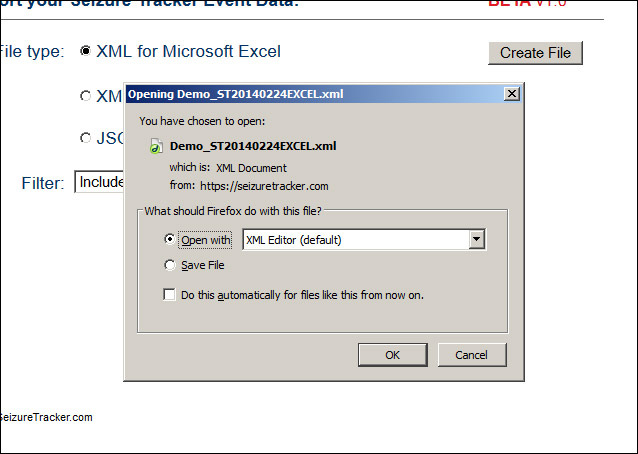 Files can be created in XML for Excel, XML or JSON formats. The data export tool is available through the Control Panel page. 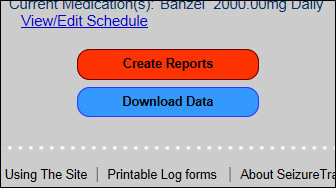 You willl find the blue "Download Data" button/link in the lower left corner under the "Create Reports" button. • Select a data file type to download. • Select date parameters for download. The default is "Include all Entered Items" and includes all event data (this currently just includes seizure event data). You can also select "Use Date Range" and enter date parameters for the data export. • Click the "Create File" button. • Most browsers will open a window to download/save or open the file you just created. • Save or open the file in your desired program. Once saved to your computer these files can be easily emailed or imported into the data evaluation program of your choice. As of 2/24/2014 this tool was still in BETA. Please feel free to send any feedback to Support@SeizureTracker.com.